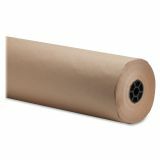 Sparco Bulk Kraft Wrapping Paper - Wrapping paper roll is made of 40 lb. Kraft material for versatile protection against scuffs and scratches. 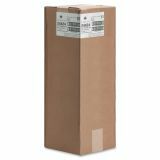 Nonperforated design allows you to unravel as much or as little as you like to accommodate a variety of tasks. Easy-to-use construction allows simple installation and removal when used with your paper cutter (sold separately). Wrapping paper roll is perfect for layering items, wrapping products, protecting surfaces and more.